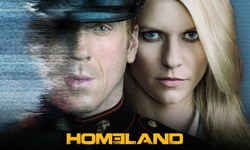 Season 1 of Homeland has been a real roller-coaster, I fell in and out of love with it pretty much every couple of episodes, swinging wildly between nearly giving up on it in frustration, and counting the hours until the next episode was on. My attitude towards the series moved pretty much in time with the central question of whether Carrie was paranoid in her obsession with Brody and Abu Nazir or whether she was brilliantly perceptive. Of course the answer all along is really that she’s both – just because you’re paranoid doesn’t actually mean they’re not out to get you and just because you’re brilliant doesn’t mean you’re always right. The frustration is that in almost every situation she makes the wrong decision and takes the wrong action – she doesn’t follow protocol, and the further she strays from accepted behaviour (which is already a pretty long way from ‘normal’ for the CIA anyway) the harder it is for her to return. That’s where most of my frustration came, watching her make increasingly stupid and desperate mistakes that endanger the very things that she’s so desperate to protect – her job and her country. The CIA doesn’t come across particularly well here and I can understand Carrie’s frustrations, she has a mental illness to excuse her eccentricities, but her superiors’ attitudes towards her blow hot and cold without apparent reason. You wouldn’t have thought there was much point in having a highly trained intelligence officer with ridiculous security clearance and then telling her off for being too suspicious! Or is that all part of someone’s plan? There are so many levels of subterfuge and pretence going on it’s hard to not be paranoid! Meanwhile, round and round throughout the season, is the big question – is Brody a good guy or a bad guy? As I said in my pilot review, the genius of the show is that it doesn’t actually matter whether the answer is yes or no because he’s such a fascinating character. His interactions with his family and the difficult process of settling back into a life he’d been so far away from is fascinating. I was a bit dubious after the pilot whether the story was sustainable, half the fun of the pilot was the question of whether Brody had turned and I thought that had been answered, then a few episodes later I thought it had been answered again, the opposite way, and so it proceeded for the whole run. Even now I’m not entirely certain. The zigging and zagging of the story, and Carrie’s increasingly desperate attempts to keep up were engrossing. The complexity of the characters and the quality of the acting, particularly Clare Danes and Damian Lewis are absolutely astonishing, I’d been impressed throughout, but the final couple of episodes were incredible. As the story developed it got bigger, reaching out beyond the key characters until it becomes entwined with the highest levels of politics and the military. That makes me a little nervous for season 2, I’m far more interested in watching the characters than I am in following the complex issues of terrorism and politics and I hope that the series doesn’t get too big in that sense. Season 1 was completely engrossing because it never lost sight of the individuals and how they were feeling and understanding their motivations. While there was a little bit of a lull in the middle of the season, the last few episodes ratcheted the tension and the action up to proper edge-of-your-seat levels. The way they managed to pull everything together for the finale was artful, answering questions in a way that felt satisfying and yet also opened up plenty of new questions. A show this smart and compelling is rare and I’m very glad I stuck with it.